Cabrera's hutia is found in mangrove forests. Its diet generally includes leaves, bark, fruit, lizards and other small animals. Cabrera's hutia is mainly arboreal. The communal nests it reportedly builds in mangrove trees are circular, measuring about 1 m (3.3') in diameter, and are built out of mangrove branches and leaves. Cabrera's hutia is known only from a few specimens collected in the mid-1970's on the islands of the Cayos de Ana Maria, off southcentral Cuba. It is very localized but is abundant in the areas where it occurs. The area is remote and there are no plans for development (Alvarez & Gonzalez 1991) . It is known only from a few specimens collected in the mid-1970's on the islands of the Cayos de Ana Maria, off south-central Cuba. Cabrera's hutia is very localized but is abundant in the areas where it occurs. The area is remote and there are no plans for development (Alvarez & Gonzalez 1991) . 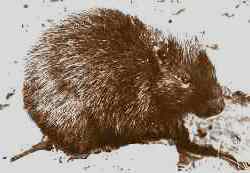 Cabrera's hutia is found in mangrove forests. The diet of Cuban hutias generally includes leaves, bark, fruit, lizards and other small animals. Cabrera's hutia is mainly arboreal. The nests it reportedly builds in mangrove trees are circular, measuring about 1 m (3.3') in diameter, and are built out of mangrove branches and leaves. 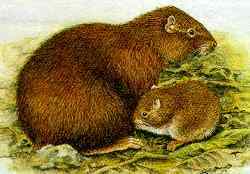 Cabrera's hutia has been reported to build communal nests.